Ashley and Tim chose the beautiful Opal Sands Resort on Clearwater Beach as the venue for their wedding ceremony in early Fall. Ashley looked stunning as she was escorted down the aisle by her father to join Tim under their gorgeous wedding arch. 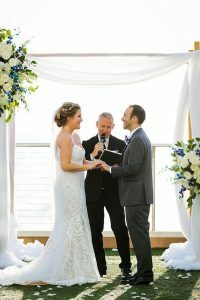 There, in front of their family and friends, on the beautiful white sands, and with an amazing view of the Gulf of Mexico as their backdrop, the couple shared their vows, exchanged rings, and were pronounced husband and wife by Rev.Rick Lackore of the Tampa Team of Sensational Ceremonies . Ceremony music and sound provided by Jason with Grant Hemond and Associates, Inc. ; Venue Coordination provided by Diana along with the rest of the staff at the Opal Sands and Wedding Planning, florals and décor provided by Barb and her staff with the Artistry Designs Group . Special thanks to Wedding Photographers Rebecca and Michael with Limelight Photography for capturing and providing this beautiful photo as Ashley shared her ring vows with Tim! Congratulations to the new Mr. and Mrs. Tim Diesel!